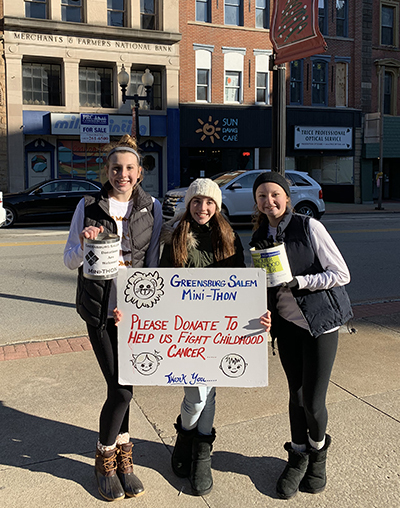 From staying up all night dancing, to community nights at local restaurants, to pancake breakfasts, canning for change and a kitchen take over, Greensburg Salem High School has raised over $150,000 for pediatric cancer in the last 4 years. This year along, GSHS Mini-THON raised $50,737.33 through various fundraisers, events, sponsorships and donations. The 2019 committee, comprised of 5 students, planned and implemented Mini-THON as a part of their senior projects. Leaders, Malia Anderson, Dajauhn Hertzog, Keara Lint, Allie Zahorchak, and Natalia Zucco, all had delineated duties based upon their potential future career. Mini-THON holds different events throughout the year to raise money. This year they held a Pancake Breakfast, a Back to School Tailgate, canning in town, a kitchen takeover at Bean and Baguette and last night’s Community Hours. This past summer they even handled all of the lemonade and pop stands at the Westmoreland Arts and Heritage Festival and receive money from the Festival for it. More than 50 kids volunteered to man those stands during the 4 days. Last night’s Community Hours fundraiser, where members of the Community were able to enjoy dancing, games, face painting and caricatures and a wide variety of games was the culmination of the committee and volunteer’s hard work. Throughout the night 150 student dancers stayed on their feet for more than 12 hours while other activities kept everyone energized. Fun competitions like Human Bowling and Human Hungry Hungry Hippos between students kept them moving and motivated all night long. 5 young ladies donated more than 10 inches of their hair to help those who lose it during the Chemo process during the event. A highlight of the evening was guest speaker, Lisa Mankins, a teacher at the Greensburg Salem Middle School, who gave an inspiring speech about her battle with Breast Cancer and how she is now Cancer Free. GSHS Mini-THON is partnered with Four Diamonds in the fight against Pediatric Cancer. 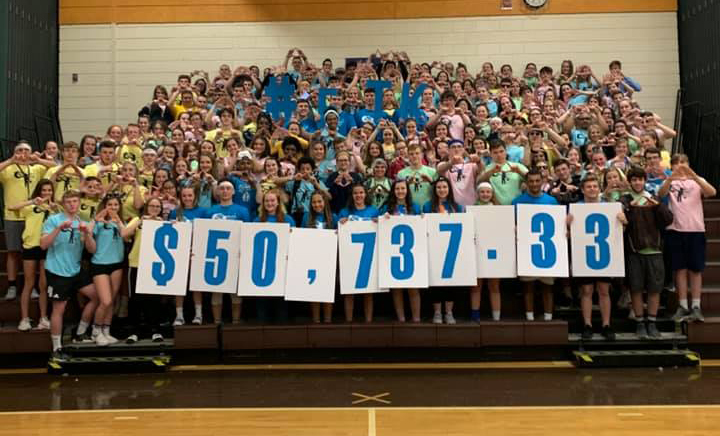 Dollars raised by Greensburg Salem High School Mini-THON® 2019 ensure that every Four Diamonds child, regardless of income, receives the highest quality of cancer care without ever seeing a bill for that care. 100% of the money earned goes to kids with cancer, their families and research to help find a cure. So proud of the GS students, GS teachers and Greensburg community for supporting this cause. These students worked countless hours and learned many life lessons in their efforts.